It’s hard to imagine a celebration that wouldn’t be enhanced by a bottle of Champagne. It is so delightful that the mere word connotes a feeling of absolute merriment, the kind of which we associate with life’s most precious moments. Champagne is joy. Having established this truth, don’t let the holiday season pass by without enjoying at least one bottle. Well, after trying our simple, yet chic Champagne cocktails, chances are you’ll have more than one empty bottle lying around the house. First things first: buy a bottle (or several) of Champagne Brut (dry). The ingredients in the recipes below will lend enough sweetness to the cocktails, so it’s best to use Champagne with very little residual sugar. Fill a champagne flute 1/4 full with pomegranate juice. Then pour in champagne until flute is 2⁄3 full. Drop in 5 or 6 pomegranate seeds and garnish with a sprig of fresh rosemary. Fill champagne flute 1/4 full with apple juice. Then, pour in champagne until flute is 2⁄3 full. Drop 1 cinnamon stick into glass and garnish with an apple peel, approx. the length of your middle finger. Sprinkle a dash of ground cinnamon on top. Bring 1 cup of water to a boil and remove from heat. Add 4 green tea bags and steep for 10 min. Remove tea bags, add 1/2 cup sugar to saucepan, and return to heat until sugar is dissolved. Remove from heat and allow to cool. Add 2 tsp of green tea syrup to champagne flute and then pour in champagne until flute is 2⁄3 full. Thinly slice one piece of cucumber lengthwise. Wrap slice into a spiral and drop into flute. Garnish with a sprig of fresh mint. And there you have it! Joy in a glass. 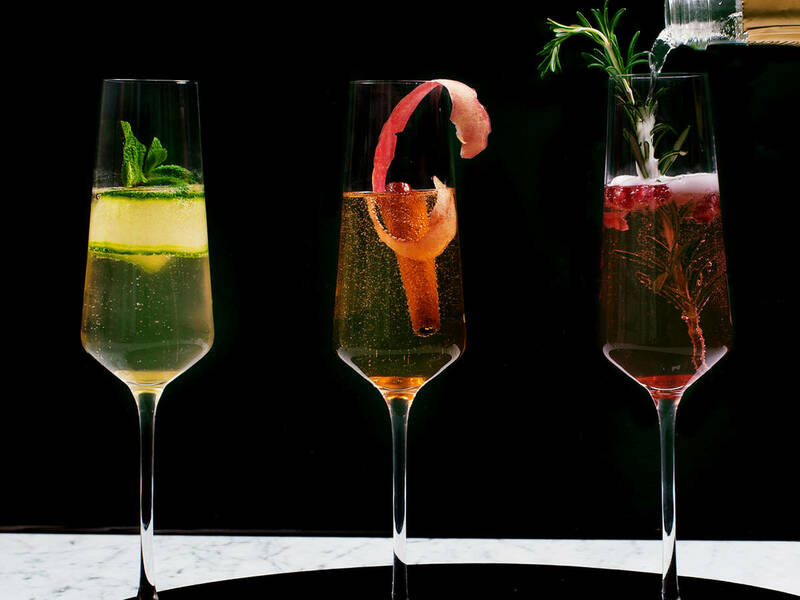 These Champagne cocktails are elegant enough for any occasion, yet modest enough to enjoy casually, as well. Keep an eye out in the future for more delicious cocktail creations!